Calgary’s high downtown office vacancy continues to strain the city’s central retail market, according to a new report by Barclay Street Real Estate. The Central Business District (CBD) retail vacancy rate fell from 11.5 to 10.8 per cent by the mid-point of this year. However, it remains significantly higher than Calgary’s overall retail vacancy rate of three per cent, which has been driven mostly by the city’s strong suburban shopping centres, according to the firm’s 2017 mid-year retail market analysis. The Downtown and Beltline markets account for about 10 per cent of the city’s retail inventory by square footage and the loss of jobs and people in the downtown core has been draining shops and restaurants. Meanwhile, City Council and other stakeholders have been adjusting bylaws and freeing up funds to stimulate the downtown retail market. It’s visible on Stephen Avenue where empty restaurants are popping up. “They’ve gone under because people that had large expense accounts that were there a bunch of times a week entertaining clients don’t have jobs anymore,” McGregor said. She said most forms of suburban retail in Calgary remains very strong. To help prevent further retail bleeding downtown, the City amended its Land Use Bylaw to create a Centre City Enterprise Area that would suspend the requirement for development permits for changes of use, exterior alterations and small additions. The amendment, which took effect on Monday, will remain in place for only three years, and excludes some businesses including liquor stores, pawn shops and nightclubs. McGregor said the Calgary Economic Development Board (CED) is also working on a plan to permit pop-up retail and possibly pop-up office spaces in the CBD. The city has also set aside $10 million to help revitalize the downtown, according to the Calgary Herald. Council approved taking $10 million from its contingency fund to start the Economic Development Investment Fund to help ease the economic strain and help to fill about 12 million square feet of unoccupied office space downtown, the Herald reported. 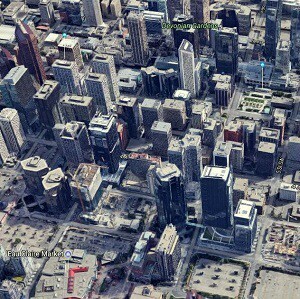 Calgary’s downtown office vacancy rate is projected to rise to 27 per cent later this year when two new offices open, according to the Conference Board of Canada. New ways of thinking about downtown retail in Calgary are needed, said Craig Patterson, a retail consultant and editor-in-chief of Retail Insider. “Landlords in Calgary have the opportunity to take some under-utilized space . . . and animate it with something interesting,” he said. “It could be anything from a one-week pop-up with a new brand, a new food concept. They could get really creative and innovative. Calgary’s downtown core is not a tourist destination, Patterson said. “There are also not enough people living downtown, like in Vancouver, to support a lot of retail, so it really is the office market (that’s) shopping downtown,” he told RENX in an interview. He said the CBD retail vacancy could be a lot worse, given the realities of the office market. He said Calgary’s three per cent overall vacancy rate is a testament to Calgary’s strong shopping centres. McGregor said there are downtown retail deals to be done. “Rates are lower than they have been, but they’re still not rock-bottom,” she said. Unless oil and gas rebounds or landlords and developers begin to diversify their tenancies, McGregor expects the vacancies to remain.